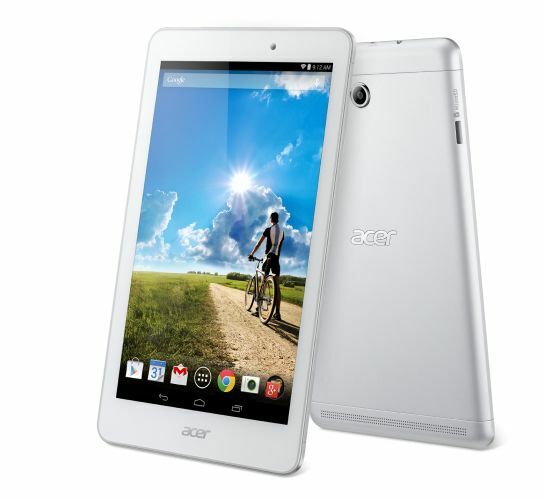 Acer's latest tablet features an Intel Atom quad-core CPU and Android 4.4 KitKat along with an 8", full-HD display. Computex 2014 is set to kick off on Monday, coinciding with Apple's WWDC event as always, and Acer is starting the party a bit early. The company took the wraps off their latest tablet, the Iconia Tab 8 which looks to rival the iPad Mini and other midsize tablets. Coming in at 8" and featuring a full-HD IPS display with a resolution of 1920x1200, the Tab 8 is one of the few Android tablets that are powered by Atom processors. A Bay Trail Z3745 CPU powers the KitKat OS, but Wi-Fi, microSD and 7.5 hours of battery life are the only other specs that have been unveiled so far. Acer is also touting "Zero Air Gap" technology on the Tab 8's display, claiming that it reduces light reflection and provides better readability under sunlight. Sadly, there is no word on exact pricing and availability outside of an expected Q3 launch, but we fully expect more details to be available in Taiwan later this week where we'll be on hand as usual. Acer today debuted the Acer Iconia Tab 8, a highly portable 8-inch tablet with a Full HD display with IPS (1) and Zero Air Gap technologies and Intel® Atom™ quad-core processor for a fast and immersive multimedia experience. The Iconia Tab 8 also sports a sleek and elegant design with a sophisticated metallic silver rear cover and slim profile that fits comfortably in one hand. Its excellent value, stylish design and great functionality make it compelling for young users and families. Outfitted with an 8-inch Full HD (1920 x 1200) display with IPS (1) technology, the Acer Iconia Tab 8 makes games, videos and web browsing incredibly brilliant and vivid from wide viewing angles. The viewing experience is further enhanced with Zero Air Gap technology, reducing light reflection, bringing higher contrast and delivering brighter, crisper images, as well as better readability under sunlight. The Iconia Tab 8’s display also features an anti-fingerprint coating that reduces messy fingerprints, making it much easier to clean and read, and 16:10 aspect ratio ideal for watching videos. It is equipped with dual speakers for delivering a surround sound effect with clearer and more life-like audio. All multimedia will run fast on the Acer Iconia Tab 8 thanks to its Intel® Atom™ Z3745 quad-core processor. It runs on Android 4.4 (KitKat) and features Acer Touch WakeApp which lets users quickly and easily wake up the Iconia Tab 8 with a simple touch gesture. The Acer Iconia Tab 8 keeps users connected to Wi-Fi networks with 802.11a/b/g/n wireless support and MIMO technology brings fast Wi-Fi performance. Users can enjoy up to 7.5 (2) hours battery life when viewing video. When consumers buy a tablet, they expect both great performance and amazing battery life. Acer’s Iconia Tab 8 based on an Intel® Atom™ processor has the performance consumers need for processor-intensive applications, such as image processing and immersive 3D gaming, with the long battery life today’s mobile lifestyle requires,” said Gregory Bryant, vice president and general manager, Intel Asia-Pacific and Japan. The Acer Iconia Tab 8 features a simple and smart looking design that discerning users will appreciate including its sleek anodized silver metal back cover and slim profile. Measuring in at 8.5 mm thin and weighing 360 g light, the Iconia Tab 8 isn’t just great to look at but also comfortable to hold in one hand or easy to slip into a bag when on-the-go. It also sports dual front and rear cameras to capture all of life’s moments. The Acer Iconia Tab 8 is equipped with a MicroSD™ card slot that allows for extended storage and can be seamlessly integrated with other Acer PCs for accessing data anytime, anywhere through Build Your Own Cloud (BYOC™)(3). BYOC enables users to build their own cloud on their devices, such as music, photos and other types of content on a reliable and secure platform with convenient access to their information and content anytime, anywhere. The Acer Iconia Tab 8 will be available starting in Q3 2014. 2 Battery life may vary depending on usage. 3 Acer BYOC is available on Windows Desktop, Android, iOS and Windows 8 UI, and is preloaded in Acer consumer PCs and Acer Android devices.